The Basilosaurus is one of the creatures in ARK: Survival Evolved. One of the stranger creatures in the waters surrounding the Island is Basilosaurus solatiumfecit. It's a powerful swimmer which has adapted to the shallows so remarkably well that it rapidly recovers from injuries when near the water's surface. Conversely, it's vulnerable to deep water pressure, which slowly causes it harm. Basilosaurus is usually closely followed by other predatory creatures, as its eating habits leave plenty of scraps for scavengers to consume. It is a gentle creature towards humans and happily laps up food directly from them. However, the creatures that trail the "Basi" tend to become dangerously enraged whenever this occurs, as it leaves no leftovers for them. Despite the hassle of engaging with its ornery followers, many tribes still attempt to tame the Basilosaurus, as its mammalian, warm-blooded circulation provides a rider with perfect comfort from both heat and cold. Being apprehensive in nature, Basilosaurus is equipped with a defense mechanism that prevents it from being stunned or shocked. Alternatively, Basilosaurus is hunted (perhaps too vigorously) for its special blubber, which can be efficiently refined into gasoline! Unlike many other huge marine animals, the Basilosaurus is not aggressive and tolerates survivors and other animals unless attacked. When taming however, beware; when it eats it creates a cloud of red around its mouth (presumably blood) which will attract other animals near it, including aggressive Megalodon and Mantas. The Basilosaurus is not actually a reptile despite its name, but a whale. It has a long snake-like body that undulates through the seas of the ARK like the sea serpents of folklore and its head is like a crocodile, full of sharp teeth. It shares physical similarities with Orcas and Baleen Whales such as the Humpback or Blue Whale. Its size seems roughly Mosasaurus-sized. Although, surprisingly it can fit through a dinosaur gate. This section displays the Basilosaurus's natural colors and regions. 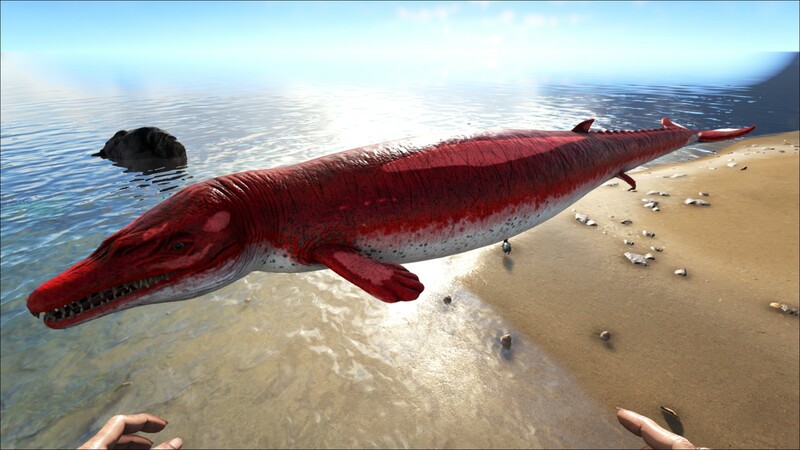 For demonstration, the regions below are colored red over an albino Basilosaurus. The colored squares shown underneath each region's description are the colors that the Basilosaurus will randomly spawn with to provide an overall range of its natural color scheme. Hover your cursor over a color to display its name and ID. For example, "cheat SetTargetDinoColor 0 6" would color the Basilosaurus's "topside" magenta. This section describes how to fight against the Basilosaurus. Basilosaurus are passive creatures and will not attack. They are, however, normally accompanied by large swarms of Mantas which can quickly shred an unprepared player and their mount. Fighting one of these while it has a swarm around it should only be done so by a player who is prepared to have a large number of aggressive Mantas and potentially Megalodons swimming after them. As such, engaging in combat with a Basilosaurus without a mount or with a weak mount (i.e. Ichthy) is asking for trouble. A player with a decent level Megalodon and above should be able to clean up the swarm with little trouble, leaving the Basilosaurus unprotected and ready to freely tame/kill. An easy way to deal with the Mantas is to use a Baryonyx because thanks to its spinning/stun move which will help you a lot at cleaning them. The best melee weapon to use is a sword, but the Basilosaurus will take some hits before it is dead. For ranged weapons, use a Crossbow. Or it can be killed with a Mosasaurus or a Megalodon very efficiently. While not being dangerous itself as its temperament is passive, it will usually be accompanied by a large group of Manta that will swarm the player if aggro is obtained by radius or aggression. Megalodon will often patrol the waters around Basilosaurus as well with a very large aggro range adding to the difficulty of the tame or kill. Being cautious around this animal is highly advised. Basilosaurus will take damage from swimming in deeper water. Ingredients for Exceptional Kibble: 1 × Extra Large Egg , 5 × Fiber , 1 × Focal Chili , 10 × Mejoberry , 1 × Rare Flower , 1 × Water Note that the values are for optimal cases, always bring extra supplies! As stated in the dossier section under basic info. The basilosaurus resides near the surface of the water. The deeper depths will cause it harm so you won't find them anywhere near bottom. Note: Feeding intervals are only for the second feeding and onward. The first feeding will trigger a longer wait time of a couple minutes, keep this in mind if using prime meat or mutton. The Basilosaurus is a passive tame. Due to its constant wandering in the water along with the ocean's many threats it is highly advised to be in SCUBA gear and owning a strong tame such as a high level Megalodon at hand before attempting to tame. After their initial bite there will be a long grace period before eating again due to its very high food stat. However once it can be fed again it will be ready to eat within ~10 seconds for non-kibble foods. Keep lots of prime meat at hand and to keep your eyes peeled for any predators that are drawn to the Basilosaurus during the taming process. Bio Toxin and Black Pearl Gatherer - Due to the Basilosaurus unique ability, movement impairing effects such as the Cnidaria stun and Tusoteuthis grapple have no effect on them meaning they are free to attack without fear of being unable to escape. You may also note that Cnidaria do not deal any damage when shocking the Basilosaurus. Upper Water - It will protect the rider from extreme temperatures which can null the requirement for SCUBA Leggings for survivors with low Fortitude which means the rider can be more resilient if needed. However some caution is advised when taking it into deep water; it will start to suffer 5-10 damage a second in deeper waters. While this damage is rather minuscule compared to that creature's health, it will prevent it from being able to naturally regenerate and could threaten low level Basils, as well as cause problems if trying to store them near underwater bases. Oil Supply - The Basilosaurus automatically generates and stores up to 20 Oil which can be refined into Gasoline. This is a great alternative to taming the more dangerous Tusoteuthis, at least for mid-level survivors. Note: Basilosaurus is also immune to Electrophorus shock. Their shock will not damage Basilosaurus or its rider. Basilosaurus was officially revealed by Susan Claire on March 24, 2016. The dossier was revealed by Jat on March 28, 2016. Its ability to generate oil is surprisingly fast. The oil has a spoil time, but it will take a long while for it to spoil so be sure to nab that oil once the quantity is near 20. As a primitive type of whale, Basilosaurus is the first marine mammal to be revealed. The dossier mentions the Basilosaurus being hunted "perhaps too vigorously" for its valuable blubber, which can be used as an excellent fuel source. This is a satirical reference to real-life whaling, which drove many species close to extinction due to the whale oil created from their blubber being used as fuel prior to the use of fossil fuels. The name Basilosaurus solatiumfecit roughly translates as "Regal reptile placed in consolation". The genus name stems from the fact that Basilosaurus was originally believed to be a marine reptile when first discovered, hence the saurus-suffix. The species name may refer to its ability to "console" its injuries when "placed" in shallow water. The dossier states that the Basilosaurus "happily takes food directly from humans." This is a true dossier statement since the Basilosaurus is a passive tame. In reality, Basilosaurus was a deadly carnivore, the biggest of its time. However, in the game, they are almost harmless. 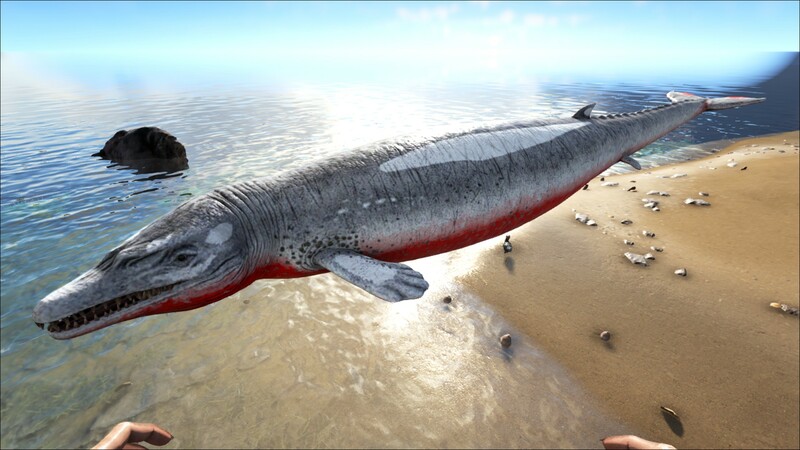 The Basilosaurus will not attack by itself when in the "Damage layer" of the ocean. So take precaution when mounting off if it is the only fending mount you have. This may be a bug since it sometimes refused to attack above the "Damage layer." In the map ARK Ragnarok, several beached Basilosaurs can be found all along the east beach and can be harvested for Hide, Keratin, Oil and Spoiled Meat. The basilosaurus makes a good depth gauge for determining whether squids and mosas will attack the player. They start taking crush damage at both species swim ceiling. If given the console command “infinitestats” in the “Damage Layer” it will die instantly. Basilosaurus can jump out of the water. This page was last edited on 14 April 2019, at 16:20.